Work places have some work ethics and rules. And one of the major rules is following the work time. A lot of managers can tolerate lazy employees, but no one likes employees who are not regular at work. Being irregular at work or missing out on you working hours regularly promotes non-serious attitude at work for other employees as well. Every task needs some time and when you miss out on your work hours, you definitely miss out on the deadlines as well. This not only makes you a bad employee at work but it also affects your repute. A good employee must not take any work hours off unnecessarily. We all have our own personal commitments. But it is very important to learn to create a balance between our personal and professional life. When you see an employee missing out on the working hours, it is very important to give them a verbal warning. If they do not improve, a warning letter can be issued. We just received an email from our HR department and we were shocked to know that you have been missing out on your working hours. An eight-hour shift has been designed in a way to make sure that the planned work is completed. Also, in an eight-hour shift, you have a one-hour official break as well. During your break time, you can have lunch, take a nap or even go out. But except for this break, you are not allowed to leave the premises. We can understand that employees might have emergency situations. In such situations, you must apply for a leave and inform your line manager. Once, your line manager approves your leave, you can go. If you apply for certain hours leave, that means you must come back to work in time. Regular attendance is very important for your experience and learning at work. 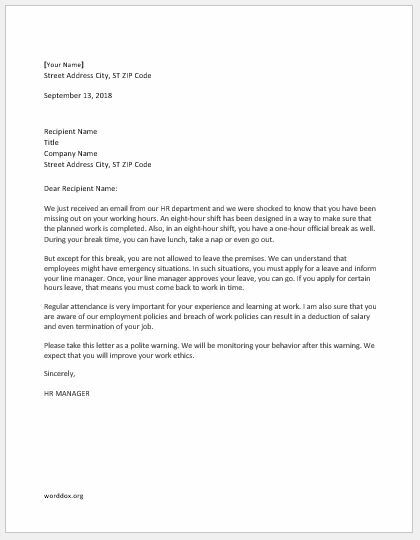 I am also sure that you are aware of our employment policies and breach of work policies can result in a deduction of salary and even termination of your job. Please take this letter as a polite warning. We will be monitoring your behavior after this warning. We expect that you will improve your work ethics.